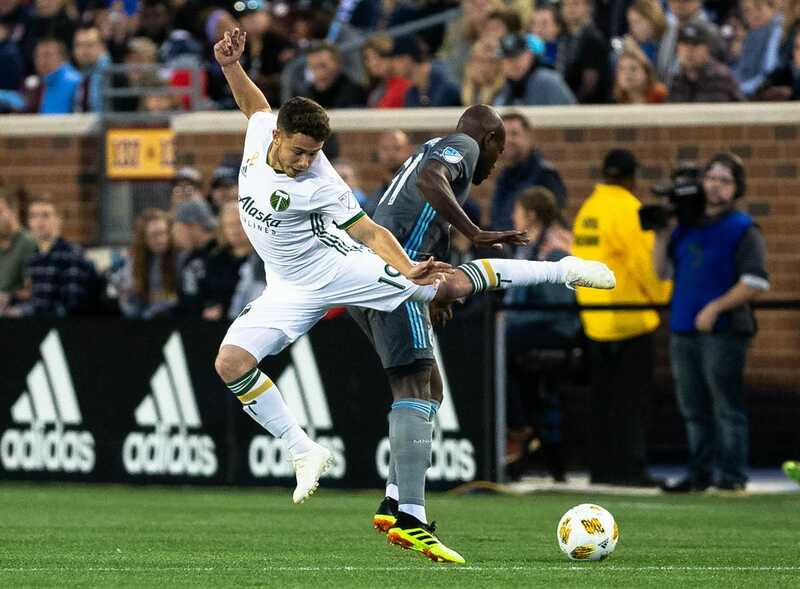 With its fading playoff hopes in jeopardy, Minnesota United jumped out to a 3-0 lead and held on despite losing a man to a red card in defeating the visiting Portland Timbers 3-2 Saturday night. With just six games left in the season and 14 points out of an MLS playoff spot, Minnesota (10-16-3, 33 points) still has an uphill battle to get a playoff spot, trailing sixth-place Seattle by 11 points with five games remaining on Minnesota's schedule. Portland (13-9-8, 47 points), in fourth place, did itself no favors regarding playoff positioning in the tightly contested Western Conference race. Trailing 3-0 at the half, Portland gradually climbed back into the contest, starting when defender Alvas Powell took an errant clear from Minnesota defender Francisco Calvo and punished the ball from 20 yards out to make it 3-1 in the 55th minute. Portland made it 3-2 when Sebastian Blanco put home a pass from Jorge Villafana with just over 10 minutes left before stoppage time. Minnesota survived playing a man down over the last nine minutes when Fernando Bob was red-carded after being cited for violent conduct. Minnesota took the 1-0 lead a little over 17 minutes into the match. Bob started the scoring play with a wonderful midfield ball over the top to a breaking Darwin Quintero. The Minnesota midfielder controlled it, pulled it back around a defender and when Portland goalie Steve Clark rushed off his line, Quintero rolled it across to Romario Ibarra who one-timed it home. Minnesota made it 2-0 just over 35 minutes into the half, thanks again to the Quintero-Ibarra duo. Picking up an errant Portland pass about 35 yards out, Quintero proceeded to hit a perfect ball down the middle to a breaking Ibarra, who once again first-timed it past Clark. The Loons made it 3-0 in the 43rd minute. Minnesota hit a corner kick into the box that Rasmus Schuller passed on with his chest to Michael Boxall, who proceeded to drill it home from 12 yards out.